students use GPS survey tools to map excavation sites. August 1, 2013. My fingers move the tiny sand granules right and left, up and down, as my eyes squint to see aberrations. A long clump is a rusted square nail. The gnarled black lump is charcoal from a fire. The sliver of bleached bone stands out among the dirt fragments. My partner Kat Kindorf is working the top area of the 4X4 mesh screen as I work the bottom area. 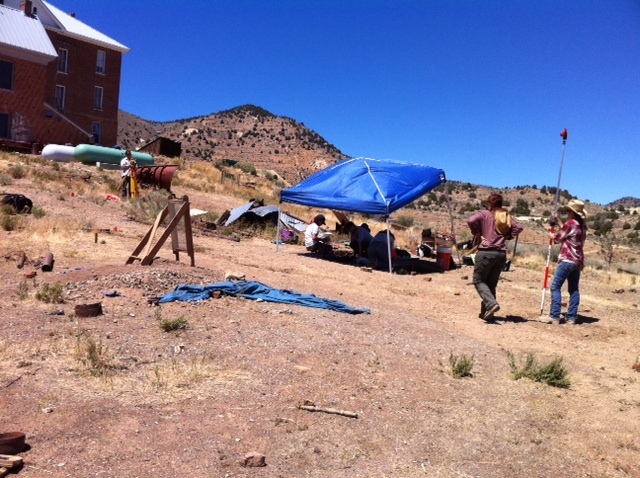 I hold a brown paper bag with numbers and code words that identify the exact location of our dig pit at this excavation by the University of Nevada at Reno in the historic silver mining town Virginia City. Our excavation pit is in front of the old St. Mary’s Hospital. Around us are other college students at various pits developing their skills in archaeological fieldwork. My brother Mike will arrive soon, driving in from Sacramento. This is also our annual family reunion, just the two of us for three days. Catching up, reconnecting, and remembering. Mike and I have participated in five earlier digs and created a circle of friends and contacts that permitted out participation again this summer. Although Virginia City has an elevation of over 6,000 feet, the sun is laser-like in intensity. It is so dry that I constantly drink fluids. Thankfully, a soft wind blows up Six Mile Canyon toward us from the town of Dayton. As we screen the soil and squint our eyes, my new friend Kat Kindorf and I share our lives and find connections. She is an anthropology student who will work hard here in the sun with me all day, then go to her paying job as a swim instructor until 10pm. The passion and energy of these students for the discipline of this exploratory work and the exclamations of surprise and joy when someone finds something rejuvenates this old soul. St. Mary Louse Hospital opened in 1876 and served this mining community for almost fifty years. The Roman Catholic Daughters of Charity opened the doors to the entire community. They gave compassionate care to miners severely wounded in underground fires and dynamite blasts. Whole families were nursed through several epidemics. Even the infamous Madame Julia Bulette helped as a volunteer nurse when cholera swept through the mining camp like a viral forest fire. Professor Sarah Cowie invited me to participate in this dig. Her motivation for the location of the dig was to get information on what women were doing in this mining community. Most of the written history of Virginia City emphasized the accomplishments of men. She hopes that the clues revealed in the earth will help tell the story of this religious community and the people they served. Behind Kat and myself looms the backdrop of rugged mountains, the high steeple of St. Mary’s-in-the -Mountains Catholic Church and remnants of this living ghost town, the locus of the greatest silver strike in American History. 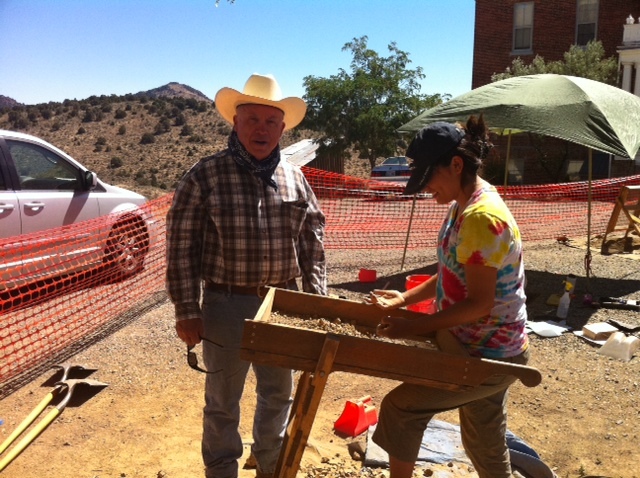 My friend, Steven Holm, assisting with the dig, said, “The gold is in the history we find screening this earth. We are the cowboys of science.” Steven taught the students how to use GPS and survey equipment to precisely locate each of the dig pits. All the tiny pieces of ceramic, glass, bone and metal will be cleaned at the university lab and where possible, glued together to recreate bottles, Chinese tea cups and medical instruments. The computer will map the different layers of each pit to hypothesize what these clues tell us about life around a hospital in a mining town in the 1870s. At the end of this day, as I lay on my bed in room 11 (supposedly haunted), in the Gold Hill Hotel, Nevada’s oldest hotel, these will be tired bones and I will be thankful for this day and the time with my brother. Each night I practice the “Examen of Conscience,” first created by Ignatius of Loyola 500 years ago. I begin with waking up today and, like inspecting the tiny granules of sand in the excavation screen, I hold up to God every event, every encounter of this day. As I walk through the day, my heart opens in gratitude for the people I have met, for the joy of having this time of recreation, and grace-filled surprises. If I bump into regret about an encounter, I look for an opportunity to make amends. I end this meditation with the Lord’s Prayer and Gloria Patri. As I do this, excavating the sand granules of each event, I recognize the faint footsteps of the Lord walking beside me. “Virginia City: Secrets of a Western Past”, by Ronald James. Dr. James is the long term Nevada State Historic Preservation Officer. This book summarizes all the different excavations in which I have participated since 2000. “Boomtown Saloons: Archaeology and History in Virginia City (Shepperson Series in Nevada History)” by Kelly J. Dixon. Archaeologist Dixon reviews the excavation of four saloons in Virginia City and the clues found to a complex, multicultural community. This entry was posted in Blog and tagged archaeology, contemplation, examen of conscience. Bookmark the permalink.